The science team that oversees the imaging system on board NASA's Lunar Reconnaissance Orbiter (LRO) has released the highest resolution near-global topographic map of the Moon ever created. Although the Moon is our closest neighbor, knowledge of its morphology is still limited. Due to instrumental limitations of previous missions, a global map of the Moon's topography at high resolution has not existed until now. With the LRO Wide Angle Camera (WAC) and the Lunar Orbiter Laser Altimeter (LOLA) instrument, scientists can now accurately portray the shape of the entire Moon at high resolution. "Our new topographic view of the Moon provides the dataset that lunar scientists have waited for since the Apollo era," says Mark Robinson, Principal Investigator of the Lunar Reconnaissance Orbiter Camera (LROC) from Arizona State University in Tempe. "We can now determine slopes of all major geologic terrains on the Moon at 100 meter scale, determine how the crust has deformed, better understand impact crater mechanics, investigate the nature of volcanic features, and better plan future robotic and human missions to the Moon." Called the Global Lunar DTM 100 m topographic model (GLD100), this map was created based on data acquired by LRO's WAC, which is part of the LROC imaging system. The LROC imaging system consists of two Narrow Angle Cameras (NACs) to provide high-resolution images, and the WAC to provide 100-meter resolution images in seven color bands over a 57-kilometer (35-mile) swath. The WAC is a relatively small instrument, easily fitting into the palm of one's hand; however, despite its diminutive size it maps nearly the entire Moon every month. Each month the Moon's lighting has changed so the WAC is continuously building up a record of how different rocks reflect light under different conditions, and adding to the LROC library of stereo observations. 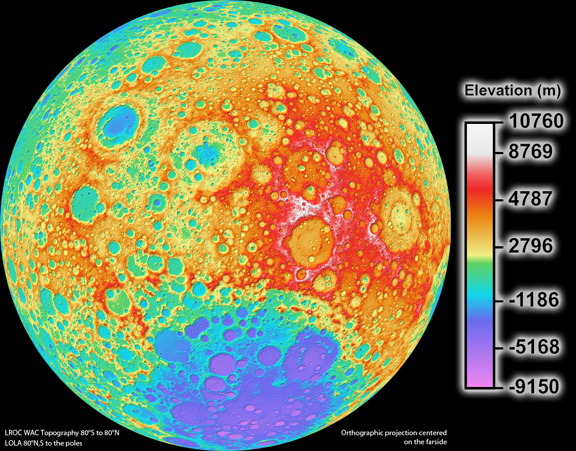 The near-global topographic map was constructed from 69,000 WAC stereo models and covers the latitude range 79*S to 79*N, 98.2% of the entire lunar surface. Due to persistent shadows near the poles it is not possible to create a complete stereo based map at the highest latitudes. However, another instrument onboard LRO called LOLA excels at mapping topography at the poles. Since LOLA ranges to the surface with its own lasers, and the LRO orbits converge at the poles, a very high resolution topographic model is possible, and can be used to fill in the WAC "hole at the pole." The WAC topography was produced by LROC team members at the German Aerospace Center. "Collecting the data and creating the new topographic map was a huge collaborative effort between the LRO project, the LOLA team, the LROC team at ASU and in Germany at the DLR," says Robinson. "I could not be more pleased with the quality of the map -- it's phenomenal! The richness of detail should inspire lunar geologists around the world for years to come." Shaded relief images can be created from the GLD100 by illuminating the "surface" (in this case the shape model) from a given Sun direction and elevation above the horizon. To convey an absolute sense of height the resulting grayscale pixels are painted with colors that represent the altitude. Visualizations like these allow scientists to view the surface from very different perspectives, providing a powerful tool for interpreting the geologic processes that have shaped the Moon.